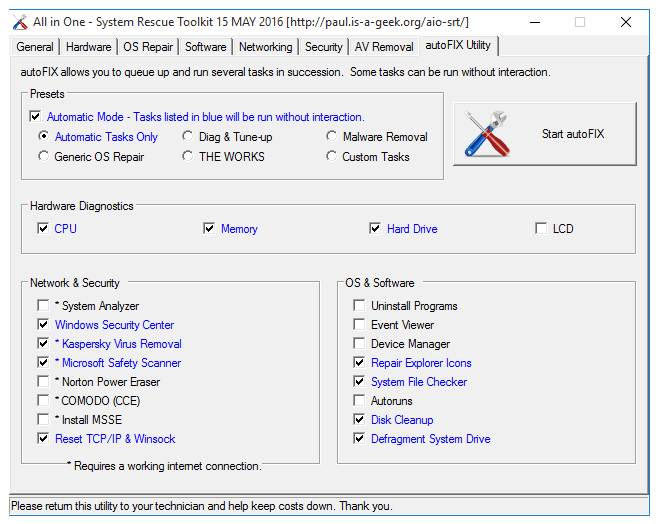 All in One – System Rescue Toolkit (AiO-SRT) is a free Windows repairing and troubleshooting software. This is a set of freeware utilities to diagnose and fix a Windows PC. This is a very good suite of utilities for PC technicians, as they can diagnose and fix a PC offline, without a need to connect the PC to internet and download the utilities (there are some tools, though, that do need you to connect to internet). The best part is that it comes in both bootable as well as non-bootable modes. So, if you are able to boot into the PC regularly, you can use that mode to diagnose and fix the PC, but if you are not even able to boot the PC from OS, you can make a Live CD or Flash Drive with this suite, and boot PC using that, to see what is going on. As I mentioned, this free software allows you to repair your PC in 2 different methods. LiveCD method: You can boot AiO-SRT either from a CD or a USB disk. 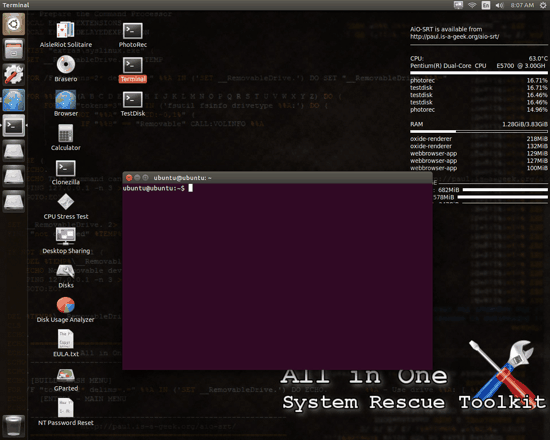 Booting your problematic PC with AiO-SRT will provide you Ubuntu based interface. In this method, the software does not have any interface. All the tools are provided on Ubuntu desktop. You can use this method if your PC is facing issues while booting. Windows Autorun method: You can also use AiO-SRT directly on Windows by extracting its ISO file. After extracting ISO file, run AiO-SRT.exe file. In this method it runs just like other application software running on Windows. This method also enables you to use Windows built in programs provided in the software to repair and troubleshoot your PC. You can use this method if your PC is booting without any issues. It is Compatible with Windows and Windows Server. Bootable live CD may also work with Linux and newer versions of Mac. Now let’s take a look at different tools provided in both the methods. In Windows Autorun method it provide tools for solving issues related to hardware and networking, virus, security, software, and OS repair. Main feature it provides in Windows Autorun method is autoFix Utility. This autoFix Utility allows you to queue multiple repairing and optimization tasks. If you want to take a look at other System rescue CD’s then click here. The software provides a list of freeware and Windows built in programs to efficiently fix most of your system’s problems. Some of the freeware also require internet connection to run. I will mention if any freeware requires internet connection or not while discussing it. 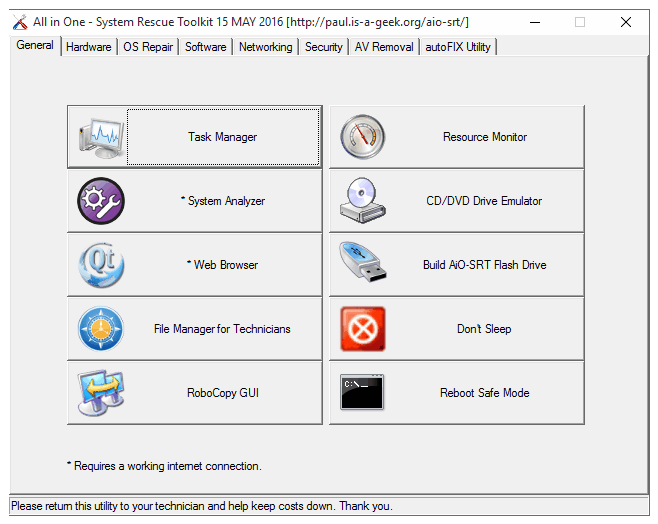 AiO-SRT has a simple layout and all the tools are categorized. Tools can be easily accessed using the categories. All provided tools are free to use. This category includes tools to analyze your system, manage computer resources, managing background tasks, etc. Some of the tools in the category just opens Windows built in tools like Task Manager and Resource Monitor. System Analyzer: Webroot SecureAnywhere scans your PC for any problems related to hardware, software, connected devices, infected files and folders, etc. After analyzing, it displays problems found. It requires an internet connection to run. It also gives you a system analyzer score out of 100. Read the complete review of Webroot SecureAnywhere here. Web Browser: Clicking on it will open Qt web browser. It compatible with LiveCD. Read full review of Qt web browser from here. File Manager for Technicians: Freecommander file manger is included in toolkit as it provide options like adding or removing network drives, directly compressing and decompressing of files and folders, and dual panels for viewing two custom locations at same time. Read the complete review of Freecommander from here. RoboCopy GUI: RoboCopy GUI is the designed front end for specifying parameters to run robocopy command in Command Prompt. Read complete review of RoboCopy GUI from here. CD/DVD Drive emulator: Clicking on CD/DVD Drive emulator button will open up WinCDemu freeware. It allows you to mount disc images on CDs and DVDs. Build AiO-SRT flash drive: It is a command line tool to make bootable flash drive of AiO-SRT software. Don’t sleep: This tool prevents your PC to go into sleep, hibernate, or standby mode. It can even prevent your system from shutting down and restart. Read complete review of Don’t sleep from here. Reboot Safe Mode: You can use this tool to reboot your Windows in safe mode. This category includes freeware tools related to monitoring and diagnosing hardware related problems. You can diagnose problems related to CPU, memory, LCD, and Hard drives. System Information: It displays complete information regarding all the system components. Device Manager: It opens up Windows Device Manager. You can manage and monitor all your connected devices from here. Hard drive diagnostics: This Windows built in tool performs sequential and random read/write actions on C:\ to diagnose any errors. After completion of actions, it displays results in text file and automatically schedule Chkdsk operation on next system boot. Disk Management: This tool lets you manage disk partitions and add or remove virtual hard disk drives. Defrag System Drive: This tool allocates contiguous memory space to all files which results in fast reading and writing operations on hard drives. CPU Stress Test: Prime 95 is used for CPU stress testing in AiO-SRT. The tool helps you measure stability of your PC by stress testing. Read more about Prime 95 here. Hardware Monitor Sensors: It opens up HWMonitor freeware for monitoring hardware sensors such as CPU temperature, voltage, fan speed, hard disk drive temperature, etc. Read more about HWMonitor here. LCD Dead Pixel Test: It opens up IsMyLcdOK freeware for testing any dead pixel. Hard Drive Usage: It opens up WinDirStat freeware for calculating your disk space usage and cleaning up hard drives. This category includes Windows built in programs for Windows repairing like System Restore, Disk Cleanup, Windows Update Repair, etc. It also includes a freeware for enabling and disabling programs that runs automatically when Windows boot. 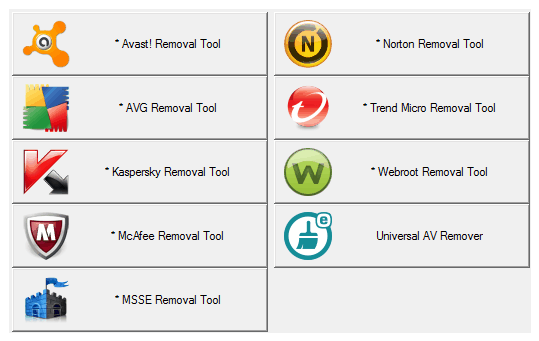 Let us see various tools in this category. Autoruns: It is a freeware which lets you enable or disable programs that automatically runs during Windows boot time. Thus this tool can help you in decreasing boot time. Read more about Autoruns here. Event Viewer: It lets system administrators to view all the events that occurred on local computer. It lets system admins to view various events that led to system crash or errors. System File Checker: It is a command line tool that scans for any corrupted Windows files and replaces them with original ones. Repair Explorer Icons: It repairs the corrupted Windows Explorer icons with original ones. 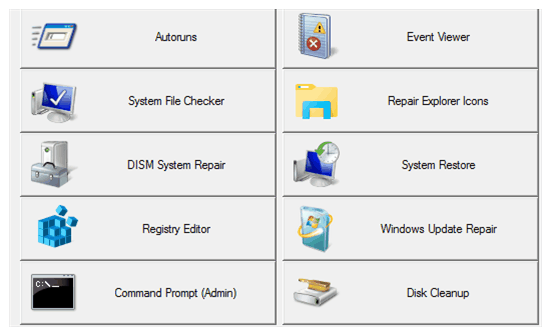 DISM System Repair: This Windows Command Line tool comes to rescue when System File Checker fails to repair the damage. After running DISM system repair, again run System File Checker to make sure all issues are fixed. System Restore: This Windows built in program will let you restore previously created system restore point. In simple words, it will automatically do all the repairing and return your system to last safe state. Windows Update Repair: This Windows tool lets you to fix issues related to Windows update. Command Prompt (Admin): This option opens up Command Prompt with admin privileges. Disk Cleanup: This Windows built in tool will recover your hard drive space by deleting temporary Windows files. Product Keys: It opens up ProduKey freeware to list all your installed software with their product ID and product key. Read more about ProduKey here. Enable Hibernate: This tool will turn on hibernate mode. Disable Hibernate: This tool will turn off hibernate mode. Uninstall Programs: This will open Program and Features window from where you can uninstall your software. Sleep & Wake Info: This tool will display information regarding Last Wake Event and Sleep Prevention Requests. Reset TCP/IP & Winsock: It automates the process of resetting TCP/IP connection by executing command in Command Prompt. You can use this tool if you are having any issues in your internet connection. Windows Firewall: This opens Windows Firewall settings window where you can turn on or turn off firewall and customize firewall settings for each network connection. Traceroute & Ping Test: This tool is for testing your internet connection. This tool works by sending packets to host you specify and displays loss percentage of packets. Modem & COM Port Test: This tool opens up Windows HyperTerminal program that can be used to set up a dial up connection to another PC. 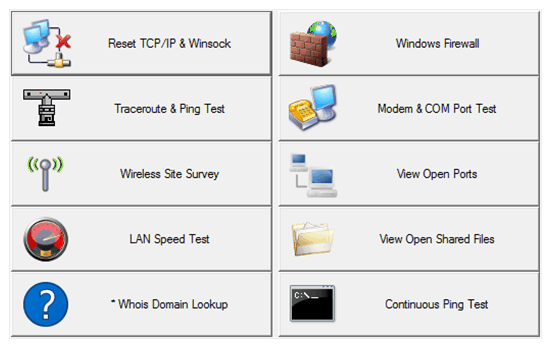 Wireless Site Survey: Clicking on Wireless Site Survey button will open up Homedale freeware that can be used to monitor all wifi access points and their signal strength. View Open Ports: This tool opens up list of open ports in your computer in a text file with their local and foreign address. LAN Speed Test: LAN speed test freeware lets you test speed of your local network. View Open Shared Files: This tool will show you list of shared files in your computer in a text file. Whois Domain Lookup: This tool requires internet connection as it displays all the information related to a domain name. It displays all domain information in a text file. Continuous Ping Test: This command line tools performs ping test infinite times until you interrupt it by cntrl+c. 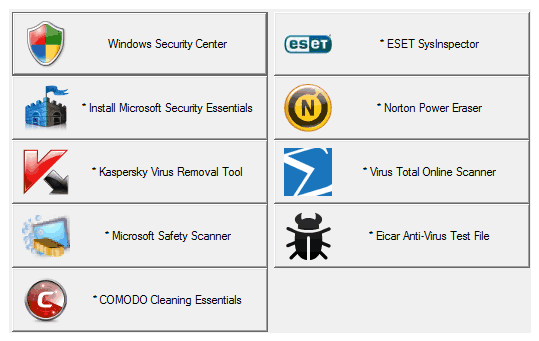 This category includes antivirus programs to remove any infectious file, application, or a virus from your PC. All tools in this category requires an internet connection to download program file first. After program files are downloaded, they are automatically extracted and run. Now you can choose either a custom location scan or full PC scan. Program files that are downloaded are not installed or stored in your PC. It is quite a handful feature as it allows you to queue multiple Windows repairing and troubleshooting task. Queued up tasks are then performed in succession. Automatic tasks do not require your attention and are labeled blue in color. Select Automatic mode if you just want to execute automatic tasks. Select a category from Presets section. Based on your selected preset, the utility program will automatically select required tasks that need to be performed. It also allows you to select custom tasks. Select any number of hardware devices that you want to diagnose. 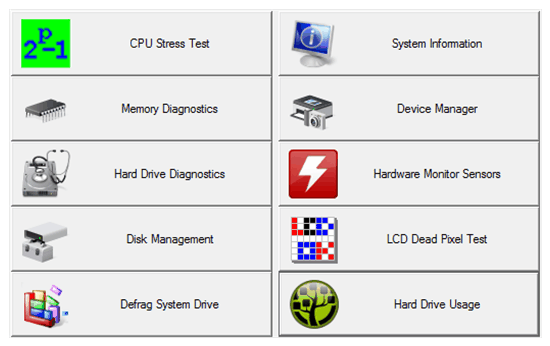 You can select from CPU, memory, hard drive, and LCD for diagnostics. Based on your selected hardware devices, utility program automatically selects diagnostic tasks related to that hardware. After you have selected tasks, you can click on Start autoFix button to execute repairing and diagnosing tasks in succession. You can use this software when your PC is facing problems while booting. You need to follow these simple steps in order to repair your PC using AiO-SRT LiveCD/Live USB. Step 1: Download AiO-SRT software by link provided at the end of the article. This will download an ISO file of the software. Step 2: Now mount downloaded ISO file on CD or USB disk. After successful completion of this step a Live CD/USB of AiO-SRT will be created. If you do not have any ISO burner then get it from here. If you need any help in mounting ISO files on CD then read it here. Step 3: Now plug in Live CD/USB drive created in Step 2 to boot Ubuntu based interface for repairing your PC. After booting your PC with AiO-SRT, interface as shown in first screenshot of this article will appear. You can find all the tools on the desktop itself. AisleRiot Solitaire: A card game that you can play while PC repairing task is executing. It can save you from boredom if repairing task is taking too long to complete. Audio Project: For creating audio CD. 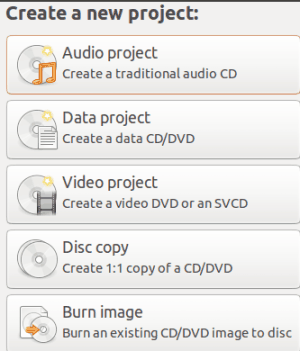 Data Project: For creating a data CD/DVD. Video Project: For creating a video DVD. Disc copy: For creating 1:1 copy of CD/DVD. Burn image: For burning an existing CD/DVD image to disc. CloneZilla: You can use this tool to clone hard drive. Read more here. CPU Stress Test: This tools increase the work load on your PC to check its operational capability. 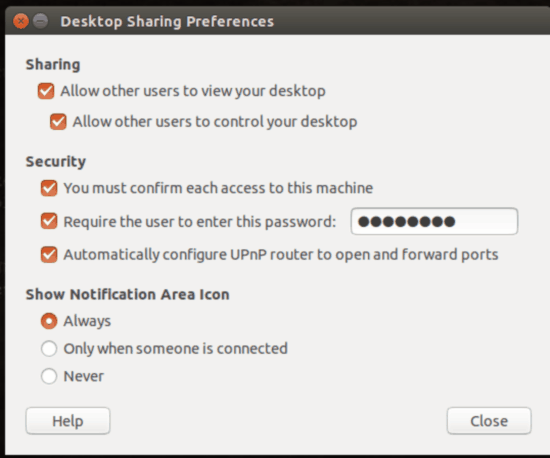 Desktop Sharing: You can use this tool share your desktop with someone else. Disks: You can use this tool to create or delete hard drive images of your system. Disk Usage Analyzer: This tool graphically displays amount of storage allocated to each disk and files/folders residing in it. Gparted: You can use this tool to create new disk partition, delete existing partition, copy/paste your disk partitions. NT Password Reset: It is not a tool. It is just a text file in which steps to reset your password is written. PhotoRec: It is a data recovery tool that can be used to recover data from hard disk and lost pictures from memory of your digital camera. Terminal: It is Command Line Interface of Ubuntu. TestDisk: This tool will check for any file system errors in your hard disk. I will surely recommend this software because of its LiveCD/USB feature it provides for PC repairing and troubleshooting. It can help you in minimizing repairing cost of your PC. I am sure that with great list of tools this software provide, it can solve most of your PC issues. I also liked autoFix utility in Windows interface for automating repairing tasks. I will advise you to not to play with some of tools in LiveCD/USB environment such as Gparted, PhotoRec, Disks, and CloneZilla if you do not know how to use them perfectly.